The Oregon Department of Transportation has closed a stretch of Interstate 84 Monday night due to spot fires from a nearby wildfire. 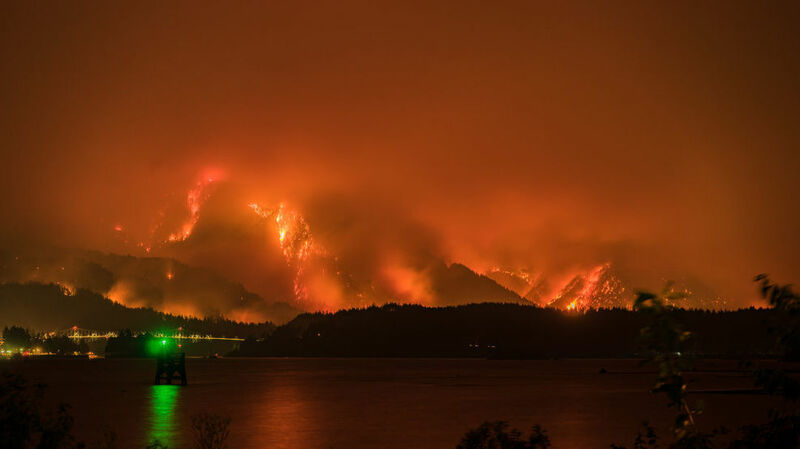 Additionally, new evacuation orders have been issued for rural Multnomah County as the Eagle Creek fire exploded Monday night. I-84 is closed between Troutdale and Hood River. ODOT earlier had allowed eastbound freeway traffic to go as far as Ainsworth State Park, but has since extended the closure. Traffic officials say eastbound traffic will now need to get off in Troutdale at Exit 17. Westbound traffic will need to exit at Exit 62, which is in Hood River. The Eagle Creek Fire was sparked by a firework Saturday afternoon, and Oregon State Police are investigating. By Monday night the fire grew to about 4,800 acres, up from 3,200 acres earlier in the day. The fire forced Level 2 and 3 evacuations throughout neighboring communities including Cascade Locks. Residents of Larch Mountain, Dodson and Warrendale received Level 3 (Go1!) evacuation orders Monday. A shelter has been set up at Yoshida Event Center at Mt. Hood Community College, 26000 SE Stark St. Gresham (17th St. entrance). Those who were issued Level 1 evacuations Sunday have been upgraded to Level 2. This includes all areas north of Wa Na Pa to the Columbia River and north of I-84 to the river. And late Monday, the Multnomah County Sheriff's Office issued a Level 3 (Go!) evacuation order for East Corbett (Larch Mountain Road and East) and a Level 1 (Get Ready) evacuation order for all other areas of Corbett. It also issued a Level 1 evacuation order for communities of Latourell and Bridal Veil. Warrendale - Level 3 GO! Dodson - Level 3 GO! Larch Mountain - Level 3 GO! Latourell - Level 3 Go!. Bridal Veil - Level 3 Go!. East Corbett (Larch Mtn Rd and East) - Level 3 Go. The homes with the greatest risk of catching fire are those in Cascade Locks south of Interstate 84 (evacuation map). Red Cross volunteers have set up a shelter at the Skamania County Fairgrounds across the Columbia River in Stevenson, Wash.
Officials have closed several popular hiking trails in the Gorge, including a stretch of the Pacific Crest Trail at the Bridge of the Gods, and trails from Ainsworth State Park to Wyath. The closures include three large campgrounds - the Wyath Campground, the Eagle Creek Campground and the Ainsworth Campground. The southbound lane (into Cascade Locks) of the Bridge of the Gods has been closed by Washington State Patrol, according to the Hood River County Sheriff's Office.